The purpose of this article is to provide a detailed review of the Explore Scientific AR127 and give any added recommendations. In a short focal length of f/6.5, the AR127 produces superior-class optical figures. The classic features associated with the Explore Scientific such as the crown-and-flint, air space, and doublet achromatic, got an upgrade, and it fits well for both beginners and experienced users. The stunning images that are revealed by the AR127 for just a fraction of the price you would pay for such superiority in a telescope add on to the appeal. What is the Explore Scientific AR127? The Explore Scientific AR127 is a scope that has great features that are worth writing home about. The fully multi-coated collimatable lens-cell maintains image contrast and eliminates light scatter. Every Explore Scientific scope is precision collimated at the factory to give optimum performance. Users all agree that the optics are first rate and that you cannot possibly get a telescope with comparable optics at a similar price. The AR series scopes have standard equipment of 2-inch two speeds. To prevent the camera barrel or eyepiece from scoring, the eyepiece holder uses a compression ring. The Explore Scientific’s mounting plate is a product of extruded aluminum, which adds on to the strength. The inclusion of adjustment screws and locking bolts allow for changes, which position the angle of the scope when put on its mount; which is important when using an equatorial mount. The Finder Scope gives a true 6° field view. Nebulosity and unclear stars can be detected because of its coated optics that provides a high-resolution image. Dual-speed focuser, Finderscope, dielectric star diagonal and a dovetail tube mount for those who want to use it professionally. 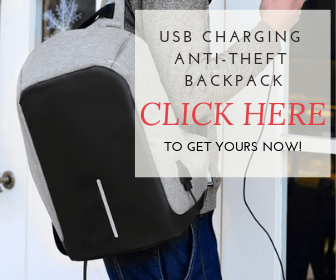 Easy to carry, sturdily built and easy to transport. It comes with a removable dew shield that protects the telescope from cold weather. The package does not include a telescope manual. It doesn’t come with an alt-azimuth mount or eyepieces. Some screws may be out of place because they don’t match the holes. You can find the Explore Scientific online, on large websites, such as Amazon. Specialized online vendors usually sell the Explore Scientific AR127 as well. You can also find a variety of offers to purchase an Explore Scientific telescope second hand. Explore Scientific AR127’s optics design and capabilities are worth noting. Lunar viewings are sharp and crystal clear. In the perfect light, you will be able to see more than just the moon. All textures, craters, crevasses, and surfaces will be seen. Fine tuning of the collimatable lens cell results in the capturing of images of planets, clusters and nebulas. The lenses are multicoated allowing no chromatic aberrations. The result is bright, sharp and contrasting images. With the powerful optics, a beginner astronomer will be able to see beyond the moon, the stars of the planets and is suitable for astrophotography. 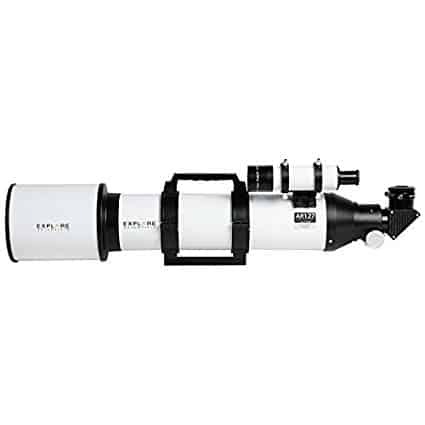 For those looking for a beginner scope to start out your astronomer journey or a more advanced range for the experienced, the Explore Scientific AR127 is a good choice. The greatly designed and comfortably portable telescope is an exceptional choice. Maintenance of the Explore Scientific is straightforward. It is one of the oldest telescope styles and boasts many advantages. They are simple to understand and in turn need less maintenance. Many people could say that it is self-maintained. The lens has a dew shield and dust covers are included. It is good to note that the scope should be stored and kept away from humidity and dust. The Explore Scientific AR127 comes with the following accessories; the 2” dielectric star diagonal, Vixen style dovetail carry handle and mount, the Crayford focuser, the removable dew shield and dust covers, 2” and 1.25” brass compression ring eyepiece holders and the 8 x 50mm straight-through finderscope. Many other accessories match perfectly with the Explore Scientific AR127. These accessories include filters, eyepieces, alt-azimuth mounts, etc. The scope is backed by a limited one-year warranty. All new products can get the Explore STAR Transferrable Unlimited Lifetime Product Warranty. The LIFETIME Warranty is applicable within the first 60 days of registration. If you had previously owned an Explore Scientific scope, then it requires re-certification. The warranty accorded by third party products is provided by third party manufacturers. It is limited to their coverage. Overall, the Explore Scientific AR127 optics is worth it. If you are an experienced astronomer, the scope is perfect for you. As a beginner, it may be confusing but if determined, you will get the hang of it and experience the thrill of a lifetime. Its lack of an instruction manual is what sets the beginners back. Eyepieces, a tripod, and a mount would also have to be purchased separately. Going through videos will help you get a clear understanding of the scope and what it can offer you. Its superiority compared to its affordability is one of the greatest pros that the Explore Scientific AR127 has. Do share with us your experience with the telescope if you’ve used it before. The more feedback, the better the understanding we’ll have of the product.